First picure was taken 1993 or 1994 at Memaw's retirement community, The Ridgewood in Beaumont, TX. The Ridgewood was previously a motel and was converted to a retirement community shortly before she moved in. It was a really cool place and Memaw was a real socialite. It had a nice commons room, but when you looked out the window towards the front all you could see was ih-10 with lots of cars and trucks going by. For the uninformed, the term 'Memaw' has always been the Hamby term for 'grandma on our dad's side'. The main thing that bugs me about this picture is: 'why didn't I take a picture of Memaw?' I don't have any pictures of her at all, and can't get anyone in my family to send me any. 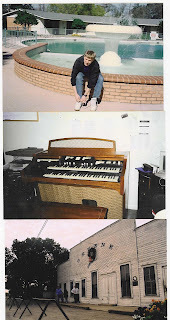 The next picture is a picture of my first Hammond organ, a late 1960s Hammond E-111. After I had discovered the idiom of jazz organ, I started to itch for a Hammond organ. Well, a B3 organ in nice condition with a Leslie can run $5000 or more. a C3 can go for about a couple grand less than that. At the time I was not in a position to acquire such an organ. One day, about 1999, I was on my way to work, and I was 'given' the knowledge that if I were to pray for a Hammond organ I would get one. I was thinking 'small' and prayed for an M1 or M3. Hammond enthusiasts will know that the M models I'm speaking of are one of the least expensive Hammonds around. Dealers usually try to sell these for $600 or more, but no one should pay over $150-300. Many people that sell these will say that these have the same sound as a B3, but they are wrong. Even though both organs have tonewheels, the M-3 lacks some important electronics crucial to the B3 sound. The M-3 also has the short spinet pedals. The E-111, though lacking some of the features of the B3, has the same internal parts as the B3 and a full size pedalboard. The last picture is a picture taken of the world famous Gruene Music Hall. If you click on the picture you will see me in a Pepsi sweater and my uncle in a blue vest. His wife's daughters are standing behind him. This was during the same Thanksgiving Holiday that yesterday's bassett hound came from. Please enjoy and I'll be back with something else some other time.